The old proverb, “it takes a village to raise a child,” is correct – but the problem is that our village is sick. In her keynote presentation, award-winning speaker Dr. Bertice Berry presents practical solutions to address the problems facing our village. Drawing on her personal experience as well as her professional expertise, Dr. Berry helps us to create and sustain a healthier village. Deftly using humor in her keynote speech, she motivates, enlightens and entertains audiences. Dr. Bertice Berry helps people find their true purpose in life. “People who walk in purpose collide with destiny,” she says. She illustrates her points with examples from her life experiences and through her amazing and unending sense of humor. She believes that people learn better when they can laugh. In her keynote presentation, she discusses the importance of finding your purpose in life and leading others into purpose. She also discusses different learning styles and points out how crucial it is to learn the style that works best for yourself and the people you are leading. She talks about diversity from a different perspective and points out that equality is everyone getting what they need to move into purpose, especially in education. In this keynote presentation, Dr. Berry discusses the evolution of race relations from slavery to Reconstruction, from the struggles of the Civil Rights Movement and the Black Power 1970s, and on to the present day, stressing the need to forgive and be forgiven. In this keynote presentation, Bertice Berry reveals that finding and using humor in the workplace not only makes work more enjoyable, but makes it more productive and positive for everyone. As a sociologist Dr. Berry address multiple areas of study including, gender, race, and age, using her life experience as a talk-show host, author, comedian and mother. 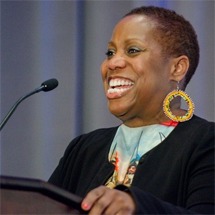 Dr. Bertice Berry reaches both corporate and private organizations with her humorous approach to subjects that have her audiences laughing and reflecting at the same time, while helping them develop the skills necessary to find optimum life-work harmony. "Bertice Berry did a remarkable job. People were constantly laughing, crying and clapping. They all loved her."